I got an invitation from choreographer Holly Harris to see a City Beautiful Christmas at the History Center downtown. A City Beautiful is a recently formed church that doesn't have a permanent brick and mortar home yet. I witnessed a fabulous celebration at the Lake Eola band shell. Cole Nesmith welcomed me when I arrived at the History Center. Much of the service would be happening inside the Orlando Regional History Center. Then the congregation would walk out into the park for an arts performance. 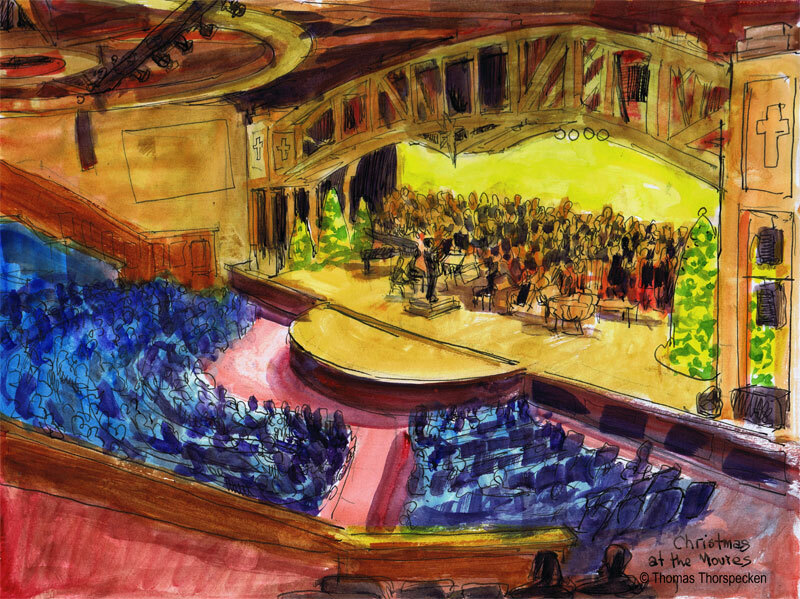 The performance is what I planned to sketch, so I leaned against one of the tall pine trees and started blocking in the stage. There was an hour to show time. White gossamer fabric hung from pine boughs. The fabric glowed yellow in the street lamp light. Two sculptures of alligators are permanent residents of the park and they overlooked the proceedings. A grey bearded man with a sleeping bag slung over his shoulder was talking to Holly for the longest time. He was invited inside but he preferred the outdoor air like me. He was to thin to be Santa Claus. He stood a short distance from me and watched me intently. He struck up a conversation, letting me know he was from Ohio. Distracted and lost in the sketch, I answered his questions but kept my hand and eyes busy. I'm a bit rude when working, and he soon wandered off. A box sat at the center of the staging area. A tech tested it out. With the lid off, it erupted, sending up a large plum of fake snow lit from below. Dancers all dressed in black began to form themselves on the grid of the stage. They all held candles. White paper bags with candles inside illuminated the path from the History Center leading people to the staging area. I had assumed everyone would sit on the grass to watch the show. I had guessed wrong. Everyone stood, and I lost my view. I had only sketched half the dancers. I could see one or two dancers between peoples heads. A fellow in front of me apologized, I told him not to worry. I've learned to accept any staging difficulty. I decided to relax and start painting. Catching the magical candle light at night would be a challenge. Music was playing that sounded like Danny Elfman's sound track to Edward Scissorhands. Since I couldn't see the dancers, I imagined ice sculptures forming with the chips floating in the air like snow. The luminescent pillar of snow blew skyward up above the wall of backs. For a magical moment, it was snowing in Central Florida. Air and Cole spoke messages of love, acceptance and Christmas joy, as I presume the dancers performed. Everyone in the audience was issued a candle. One single flickering flame became two, then four then a sea of light. Everyone's voice was raised in song. There would be a second performance, so the lights were extinguished as the crowd dispersed, I continued to sketch. The sketch felt complete even without the full cast. The gator looked hungry enough. With another hour till the second performance, I decided to pack up and head home. I went to the final dress rehearsal for the Nativity at Pinocchio’s Marionette Theater in the Altamonte Mall. It was a few days before Christmas and the Mall was overrun with shoppers. I had to drive up and down about ten parking isles before I finally found a spot in the parking garage next to the movie theater. There was panic and road rage among the cars searching for spots. It was a freezing cold night and I added my windbreaker to my arsenal of coats. The security gate was closed when I found Pinocchio’s. I went to the backdoor entrance and started firing of texts to people I hoped were inside. With no return texts, I decided I might have to sketch the theater from the children’s play area. 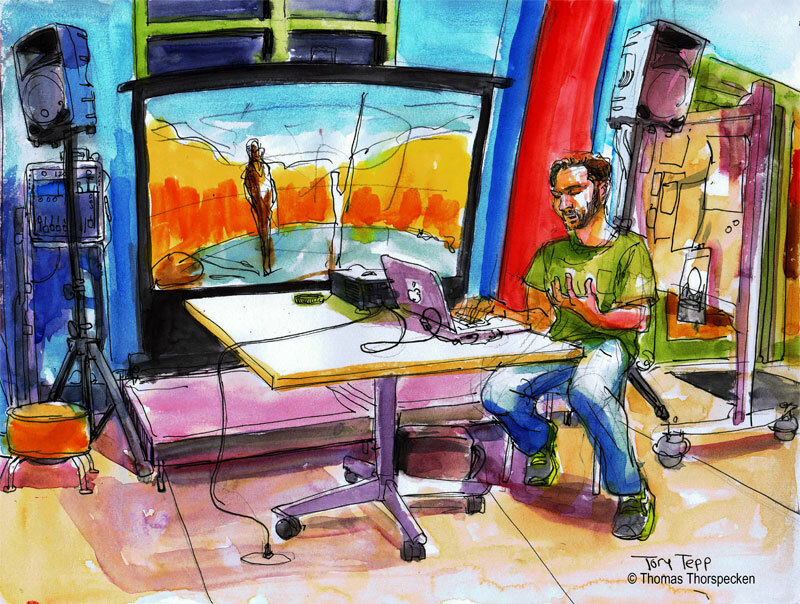 I set up my stool and was about to start sketching when I saw Sean Keohane open the gate to get in the theater. I scrambled, gathering my supplies and I ran to the theater just as he started lowering the gate. He saw me and reversed the motor. Puppeteers were given dark olive green long sleeved shirts which would help blend them into the background as they worked the rod puppets designed by Jane Henson. Sarah Lockhard who plays the Virgin Mary wasn’t at the beginning of the rehearsal, so the smaller puppets used in the actual nativity scene rehearsed several run-throughs of that scene. Sean boomed out his lines as the voice of God from the back of the theater. God speaks in Latin, it turns out. Herod hatched his evil plot to kill the new born King using the three Kings as his henchmen. Joseph was shocked when he discovered Mary was pregnant and he understandably doubts her story of divine birth. He still vows to protect his young bride. My favorite part of the play is when a banner is waved majestically over the manger. The puppeteer looks up at the banner making it wave in slow motion as if in a breeze using two rods. It is the puppeteer’s concentration and complete absorption in the process that I admire, and this was one moment where the puppeteer was in plain sight. Three musicians performed live, playing medieval music. The rest of the puppeteers remained hidden behind the stage front and faux rock work. They had knee pads on, yet several times I heard loud thumps back stage. Edna Bland iced her leg from one of those bumps during a break. There were two weeks of these back breaking rehearsals for two performances. Art isn’t easy. On November 27th, I went to Urban ReThink for one of their "ReThinking the City" presentations. Award winning artist Gillian Christy and her husband, urbanest Russell Preston discuss the art of creating great public space. Russell showed slides of empty public spaces in Boston that became vibrant community meeting places thanks to simple inexpensive urban design and public art. Gillian does large scale public art, so together they make a great team. 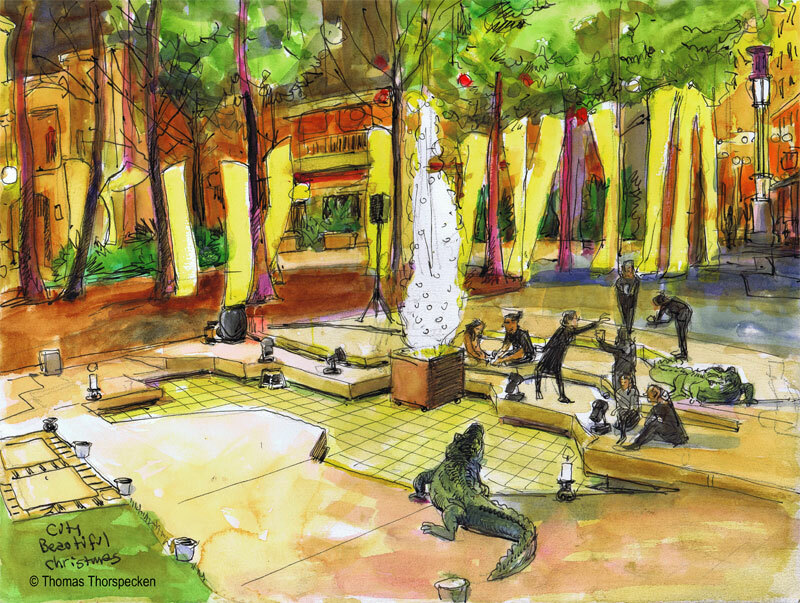 Public space design should be about creating authentic community's with people being the first consideration. 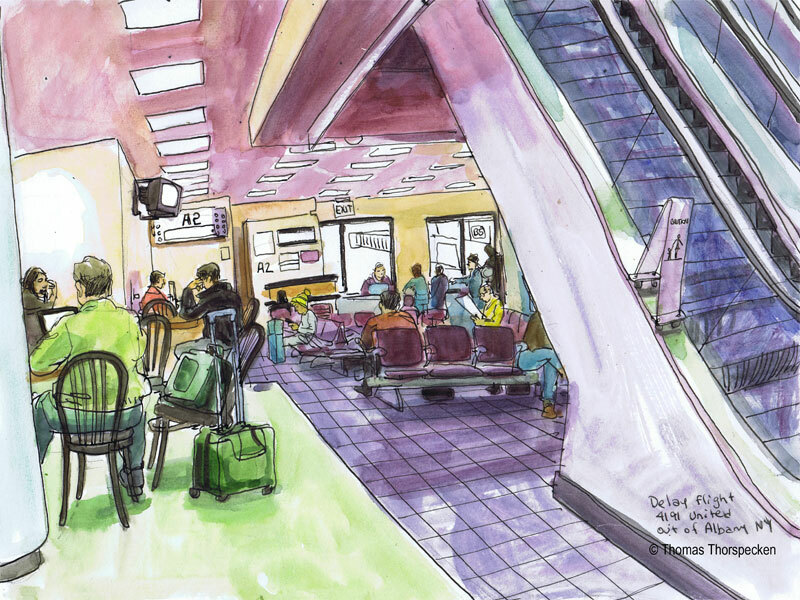 An active public space inspires art to be in it. Gillian and Russell were the first resident artists at the steelyards in Boston. Huge industrial smoke stacks were modified by adding art to them. Gillian said that her work is about connectors, things that connect people. The redesigning of vacant spaces was referred to as "Tactical Urban-ism" by Russell. Design was done lighter, quicker and cheaper. Short term action resulted in long term change. Ed Green from "Rebuilding Together Orlando" and its program, A Door to a Good Night's Sleep, that helps needy children in our community.The organization offers hope to people in hopeless situations. The last Saturday in April will be a construction day in which people come together and help rebuild home in desperate need of repair. To raise money for this effort, Rebuilding Together Orlando partnered with Home Builder's Institute, The Mustard Seed, and a major pharmaceutical company to build bunk beds for children in Orange County. The bunk beds were built with recycled wood doors and "upcycled" materials such as bed frames. They then created "A Door to a Good Night's Sleep" by embracing the talent of local artists to create works of art on the headboards. 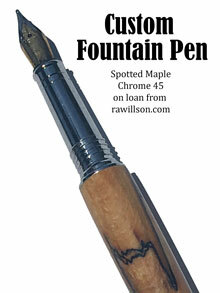 They have been beautifully painted and are showcased in an online auction. So far 11 headboards have been painted. Anyone can bid on these works of art. 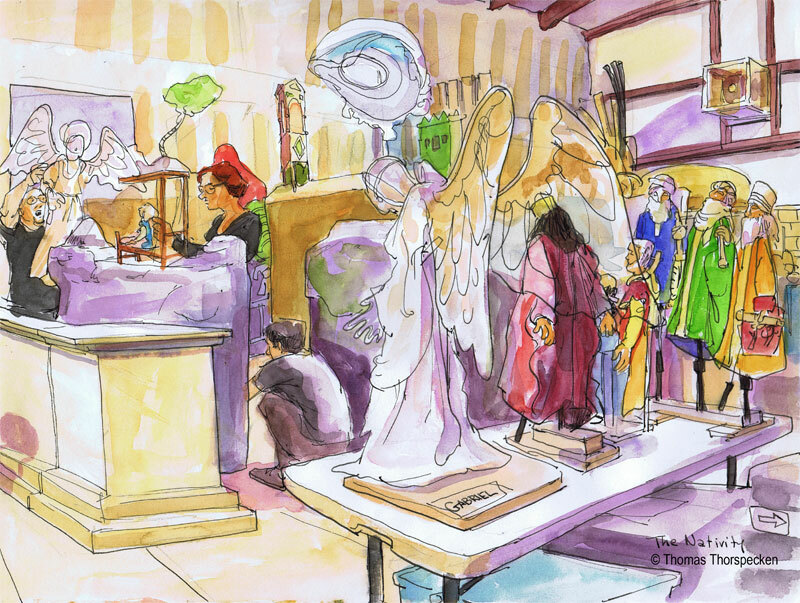 I went to the Henson's Pineloch warehouse on December 12th to sketch a rehearsal of The Nativity. Rehearsals were held most weeknights for two weeks from about 7:30 to 10pm. All of those rehearsals were for two performances on December 22 at Pinocchio's Marionette Theater in the Altimonte Mall. The oldest story in Christian history was made new in this retelling with live music, and the gorgeous puppets from IBEX Puppetry and the Jim Henson Company. This puppet production was spearheaded by Jane Henson, the wife of Jim Henson of Muppet's fame. Jane helped Jim in the early days of television production but then abandoned puppetry to raise her family. He youngest daughter, Heather Henson helped her bring this production to life. The warehouse was cavernous, filled with boxes and bins full of foam, fabric and assorted puppet parts. There were woodworking benches and large kites suspended from the ceiling. If you were to imagine Santa's toy factory, this would fit the bill. I decided to sit behind the table where the performing puppets were stored. Gabriel with his gossamer wings dominated the table. A dark sinister and conniving Herod stood beside him, visible through his transparent wings. Mary, Joseph and the three kings also waited to begin their performances. A train rumbled by adding an industrial edge to this period piece. From this angle, I could see the puppeteers who had to crouch down behind the stage setting to stay out of the future audience's view. Sean Keohane, the director corralled the cast and explained how important the telling of the story would be. It was something parents could share with there children. Sarah Lockhard worked with the Virgin Mary rod puppet. Her face expressed every emotion as she moved the puppet. It was fascinating watching actors become lost in the subtle performers. The word, marionette, means “tiny Mary” and was derived from the puppets used in medieval mystery and miracle plays. Ron Lister's home at 1642 Sunburst Way, Kissimmee is a true marvel. His home is adorned with more than 50,000 lights synchronized to music, which plays through your car radio. 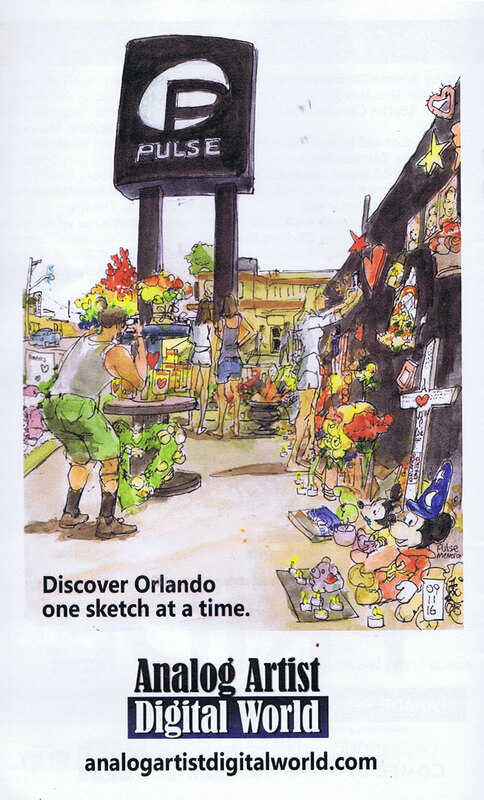 Reader's Digest magazine named it one of the country's best holiday displays in 2009. He even has his own website. Work began to set up the display back in October. Ron has been putting up this display for the past 25 years. I arrived one hour before sunset to start my sketch. I used the final moments of daylight to block in the sketch with black line work on my tablet. As the sun set, I dimmed the screen and started painting. Mosquitoes buzzed in my ears. Ron came out and added Joseph and Mary to the inflatable manger scene. Then the lights flickered on. What makes this display so unique is the amazing amount of work that went into synchronizing the lights and music. Ron used a computer program that resembles an Excel spread sheet. Each row represented a colored string of lights. The program allowed him to turn on and off each set of lights in time to the music. It was much like the amount of work that goes into editing a movie. The A frame above the garage had CDs that acted as reflectors for red bulbs. Ron said the center hole is the perfect width for the bulbs. The two palm trees are actually just PVC strung with icicle lights to create the illusion of palm fronds. The large Christmas tree is a series of hoops suspended from a pole capped with a large star. Periodically, cars would stop in the street and people would pile out to take photos of the display. Ron was there to answer anyone's questions. Sometimes he would ask a driver to turn off their headlights to avoid blinding others. He pointed out to me that the singer of one of the carols had just performed live in Celebration Florida. She travels the country performing at amazing Christmas displays. A sign in the driveway asked visitors to vote for this house in the Old Navy Griswold Lightacular Challenge. He got my vote. Fringe is pulled out all the stops for the December First Monday Happy Hour. In the round Patron's Room in the Lowndes Shakespeare Center there were tables set up with silent bidding items. George Fringe Wallace directed me to the Margeson Theatre, (orange venue) where the various performers were working on last minute tech issues. Laney Jones and Matt Tonner set to play guitar and ukulele. I had seen Laney perform twice before, both times in parking lots, so it was nice to see her on the stage. She has a sweet voice and her original folk tunes are humerus and heart warming. She sang a song about how she loves her therapist since he always listens and he has been her longest relationship. It was hilarious. 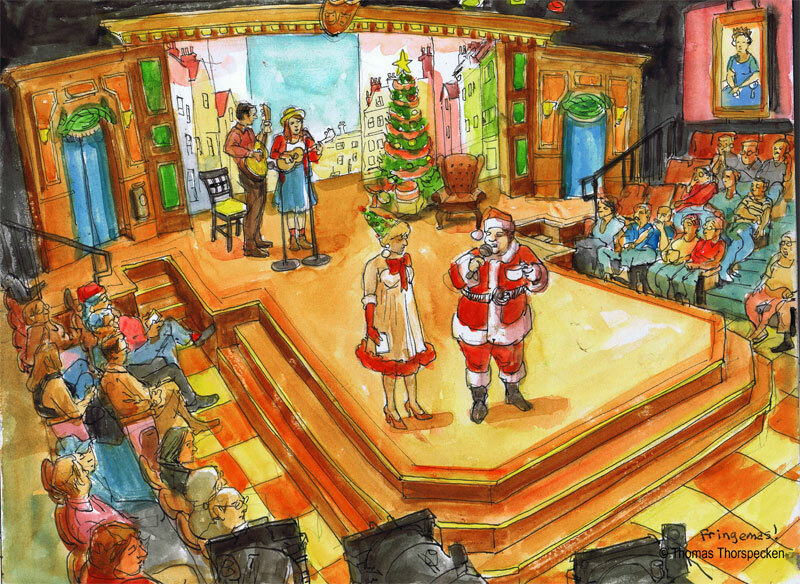 The announcers, Santa and Mrs. Claus (Michael Wanzie and Mitzi Morris) introduced each act. Joan Crawford offered a raspy and funny rendition of the 12 days of Christmas. The PB&J Theater Factory performed a crazy skit in which Brandon Roberts came out as a Gumbyesque foam Christmas Tree. The first time he appeared, he looked like a sad phallic shaped tree. Everyone laughed as he did an unenthusiastic dance. The tree costumes eventually got fuller and his enthusiasm, livelier. A Varietease dancer performed a subdued strip tease, but a wardrobe malfunction had everyone in tears laughing. Pepe acted as a guest announcer and he kept the irreverent proceedings quite lively. The set was for "The Farndale Avenue Housing Estate Townswomen's Guild Dramatic Society's Production of 'A Christmas Carol". Try and say that five times fast! The audience was full of performers who will have shows in this year's Fringe. Joe Rosier sat in the front row making a rather believable Santa with his real beard. I live vicariously through other people's trees. This tree was found at Northland, A Church Distributed (530 Dog Track Road, Longwood, Florida). I was invited here to see, Christmas at the Movies, a choral concert on December 6th. Sharon Hegedus advised me to just sit and enjoy the concert. 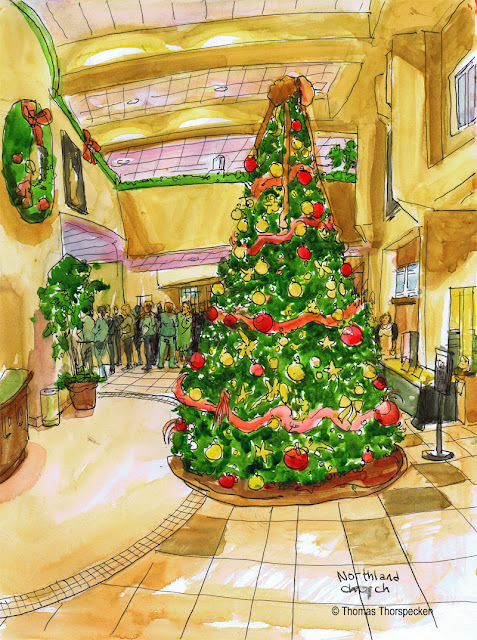 As people lined up to enter the hall however, I couldn't resist sketching the tree. Northland's lobby is a cavernous space and this tree towered 15 feet tall. It was decorated with red and gold ornaments in various sizes. There were pine cones and ribbons giving it a traditional feel. A large painting depicting the prodigal son parable was hung above the hall entrance. 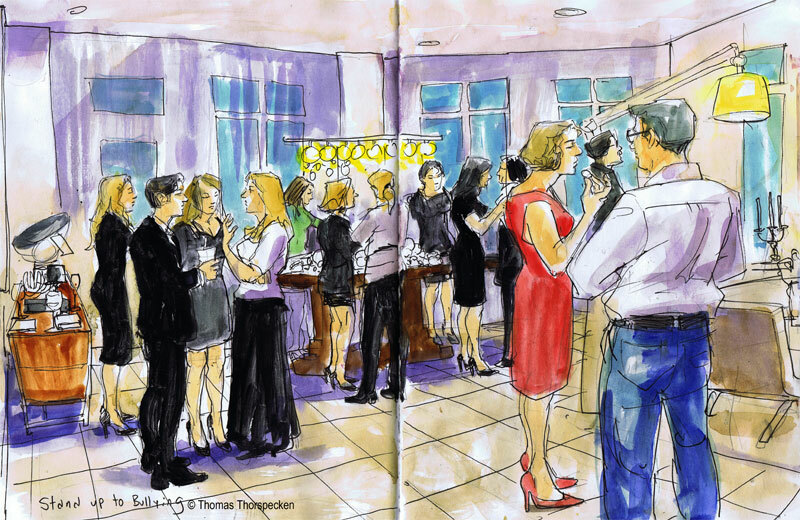 As I sketched, the doors to the hall were opened and everyone filed in. I could hear the first songs sung by the 220 person strong Central Florida Community Choir. Christmas Time is Here, Pure Imagination and a Polar Express Medley were performed as I stubbornly finished my sketch. The show was directed by Joshua Vickery, backed by a live orchestra and with participation from the Central Florida Community Dance Team. When I did go in the hall, I had to pause to let my eyes adjust to the dark. A man seated in the back row with his son, gave me his program. This unrequested act of generosity took me by surprise. I couldn't resist the notion of finding a perfect angle to sketch from. I sat on the house right and relaxed. O Holy Night welled up bringing the show to the intermission. I decided to change my seat and I walked up towards the balcony seating. The balcony was blocked off, so I sat in the last row right before the balcony. I got my book light out and started a second sketch. My sister Carol Thorspecken Martindale drove us to the Albany airport so we could fly back to Orlando. The small airport was really deserted. Getting through security was a breeze with no one in line. Unfortunately when we got to our gate, the flight was delayed. This flight was a puddle jumper to Philadelphia where we would catch another flight to Orlando. Terry immediately got on the phone to try and make sure there was a hookup flight waiting for us when we landed. With a stray hour on my hands, I of course started sketching. A woman sat down next to me to ask me about my brushes as I got close to completing the sketch. She had gone to art school, learning printmaking. When she got married and had two daughters, the art was put on the back burner for her domestic responsibilities. She had been visiting her brother who made a fortune manufacturing bicycles. He lived in a fully renovated Dutch Colonial home in the country. He collected modern art and antique bicycles. The art that his wife didn't want in the house, was kept in the barn with his amazing bicycle collection. She called over one of her daughters. There were photos on the daughters phone. The daughter had just celebrated her Bat Mitvah. To prepare for her daughter's Bat Mitzvah, the mom rediscovered her passion for art as she made center pieces for each table using found objects. Soda cans were cut and folded to create intricate, delicate flowers. I was impressed. I told her she should try selling individual flowers on an Etsy site. Her husband and his family got annoyed at her because they felt the centerpieces pulled attention away from her daughter. I was surprised when she told me that basically she got divorced over those center pieces. Her younger daughters Bat Mitzvah is coming up and she is on a roll already prepared to top her last creative en devour. Terry came back and announced that the flight was boarding. I never caught the woman's name. My sister Carol decided to car pool us all out to Gore Mountain. It was a frigid cold day. I put on all the sweaters, sweatshirts and coats I had. From the parking lot we could see the snow machines hard at work to open the slopes for the season. In the lodge people were busy putting on their sky boots, water proof bib overalls and thick parkas. People walked like Frankenstein with those big boots on. We didn't have all the equipment. We just wanted to take the gondola up to the top of the mountain to look around. I think the one time ticket to the top cost $12. I think skiers paid $59 for an all day pass. Holiday rates jump up to $79 for the day. Renting skis would cost $45 for the day. I'll walk thank you. I doubt I'd sketch any better with skis strapped to my feet. The gondolas are constantly in motion. We got on as it whipped around to go back up the mountain. The windows were frosted over with ice since the gondola passed close to several snow machines. When we got to the top, we were advised not to walk on any of the ski trails. There was nothing to stop the wind up there. You could see forever. Carol lead us all to the start of one of the trails. Kirsten, Anna and Nini found a small icy hill where they could slide down for 15 feet. I kept my hands jammed in my pockets and faced away from the wind. Carol took some photos. I wasn't smiling, my face had a grimace of shock. 0n the gondola ride down, I read a sign about the early days at Gore. Seasoned locals used to play tricks on the newbies who came up from New York City. In town they would spread rumors of bear attacks on the slopes. When the newbie went to the top of the mountain, a local would be there hidden in the woods to let out a loud bear growl. Success would be a good wipe out. I did my sketch when we got back to the foot of the mountain. 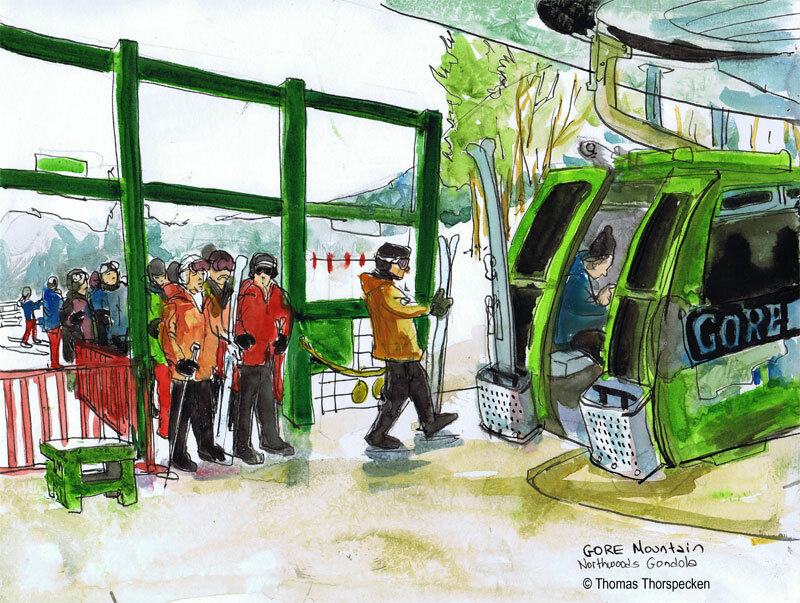 While everyone else went in the lodge to warm up, I sat at a picnic table to sketch the skiers in line for the gondola. It seemed warm compared to the top of the mountain. My watercolor paint literally crystallized as it froze on the page. I left the effect in several places and rubbed the crystals off in other places when I applied second layers of darker washes. My drawing hand had the finger tips cut off from the glove. I didn't spend a long time on the sketch because I wanted to get inside to warm up. 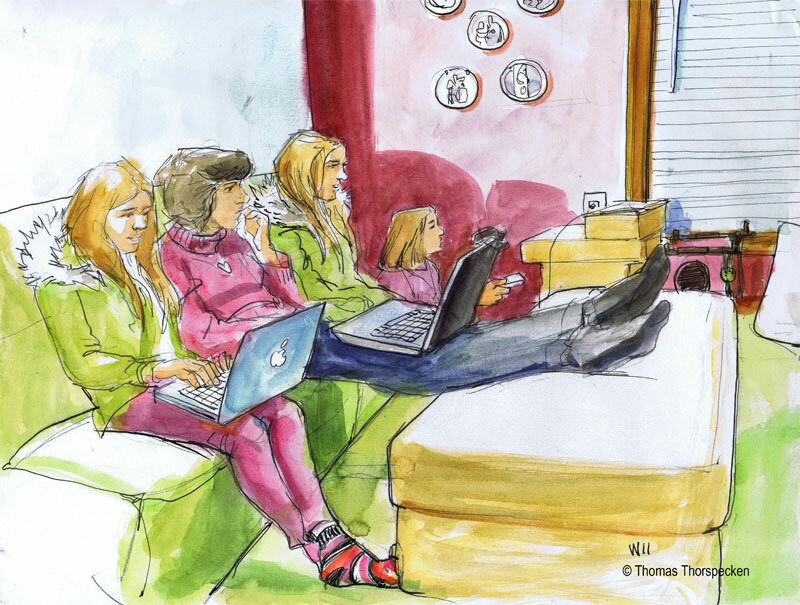 In the evenings everyone would settle into the living room to warm themselves beside their personal digital devices. Nini Thorspecken is a Facebook fanatic. She sat in her green parka with the fur fringed hood chatting to her boyfriend or updating her status. This was the one opportunity I took to sketch her. My sister, Carol Thorspecken Martindale, sat beside her and opened her laptop. I found it fascinating that Carol collects plates to hang on the wall. Ruth, our step mother collected Norman Rockwell plates. Being the youngest child, Carol must have been the most influenced by Ruth's collection. Carol's daughter, Anna Martindale, came in and started playing WII. She roped Nini and Kirsten into playing as well. Nini moved on the couch and I decided to sketch her again in her new position. Anna is very competitive. If there was a setback in the game, she would be upset almost to the point of tears. If she was winning she would be ecstatic and gloat while doing a happy dance. I joined in on a game of bowling. I was new to the game and I dropped the virtual ball on my toes a couple of times. You get to decide what your character looks like by picking eye shapes, nose shapes etc. I decided to give myself a big puffed up afro haircut. I didn't win a single game. When I needed to throw straight, the ball curved with English. When I wanted to clip a pin to make a split, the ball would roll between the pins. I was getting a few strikes near the end I think because I was kicking up my right foot to finish my stroke like a cupid on a fountain. The day after Thanksgiving, known as Black Friday, is supposed to have some of the best shopping deals of the holiday season. Actually the night of Thanksgiving, stores like Wall mart are supposed to kick off the holiday shopping binge. Carol served us Mike's Hard Lemonade which I developed a taste for. She cut up vegetables and lettuce for a salad to accompany our left over feast. Carol's boyfriend's dog eyed her progress waiting for scraps. 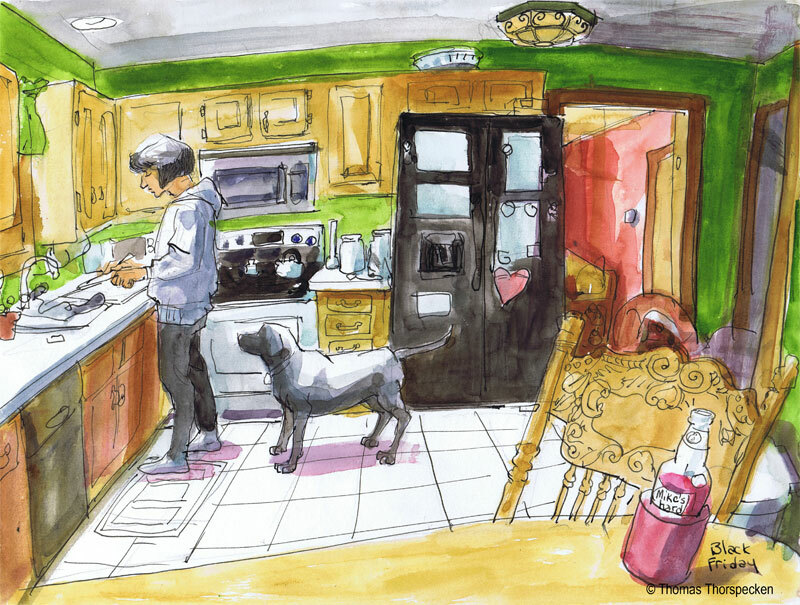 Her own dog, a dachshund named Reese's was blind but he still roamed the room by scent searching for any abandoned morsel. It was like having one of those robot vacuums underfoot constantly roaming the room. There was definitely no shortage of food and we worked hard devouring the leftovers. It began to snow. It was only flurries, but it was thrilling for people who are used to the Sunshine State. We took some less than traditional Family portraits at the dining room table. I'm sure the Thorspecken's back in Germany will be impressed by our refinement and culture. Nini Thorspecken Skyped her parents in Weisbaden every evening. Cornelia and her husband did their best to speak in English. Technology is indeed making the world a smaller place, although we kept loosing the Internet connection. We were staying at Steve Wallace's house out on Staten Island. Steve works at the Police Academy in New York City. He drove us to the Academy which is right in the neighborhood of the School of Visual Arts where I went to college. After a quick visit to his office where we left Reese's, Carol's Dachshund, we were escorted up to Macy's by another officer, Joe Deligate. We drove through barricade after barricade until we were right across from Macy's. There was a special section reserved for police family and we pressed in. I sketched as we waited for the parade to begin. My older brother Don Thorspecken showed up with his kids, Nicki and Kyle. There was a long wait. Cheerleaders sat in the street hugging their legs trying to stay warm. There were bleachers set up across the street and that was where the TV camera's were. Macy's had a large Believe sign on the side of the store. I believe it had to do with the newspaper editors reply to Virginia when she asked if there is a Santa Claus. Confetti cannons announced the start of the parade. We were at the point where the parade turned right, so we had an unobstructed view of all the floats and balloons as they approached. One balloon was of a Shelf Elf. Carol practices this tradition. A shelf elf is in the home in the week prior to Christmas. This elf reports back to Santa telling him if the children have been naughty or nice. Each day the elf is hidden in a new hiding spot and the kids try to find him. As we ate breakfast one morning, the Kids, Anna and Kirsten discovered the elf sitting right on the light above the table. I hadn't noticed, since I wasn't looking. Floats stopped at our corner so we got to shout out to the stars in the parade, like Whoopie Goldberg and Adam Sandler. Teen pop stars got the loudest shout outs. I didn't recognize them, but the teens behind me certainly did! Singer, Carley Ray Jepson, who sang that "Call me Maybe" song was on a float. The huge balloons loomed over us as they shifted in the wind. The parade went on for like five hours before we got to see Santa on his sleigh. Nini Thorspecken, my 17 year old cousin visiting from Germany, was right up front, pressed against the metal barricade. I think she was impressed by this American tradition. Terry and I went up to New York City over the Thanksgiving break. A distant cousin, Nini Thorspecken, was visiting America from Weisbadden Germany. Nini is just 17 years old so we wanted to give her an authentic taste of the Big Apple. My sister Carol Martindale came down from upstate New York and we all stayed on Staten Island. The ferry ride across the harbor to the city was gorgeous, going right past the Statue of Liberty. Carol had passes to get into the 9/11 Memorial, so that was our first stop. The memorial is amazing, with two huge square holes where the towers once stood. Water cascaded down into the wells like Niagara Falls and then the water leveled off before dropping into a smaller deeper well. Names of everyone who perished that day were etched in steel along the outer perimeter. 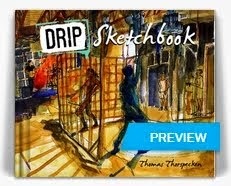 It is an amazing sight and I plan to return someday to sketch. 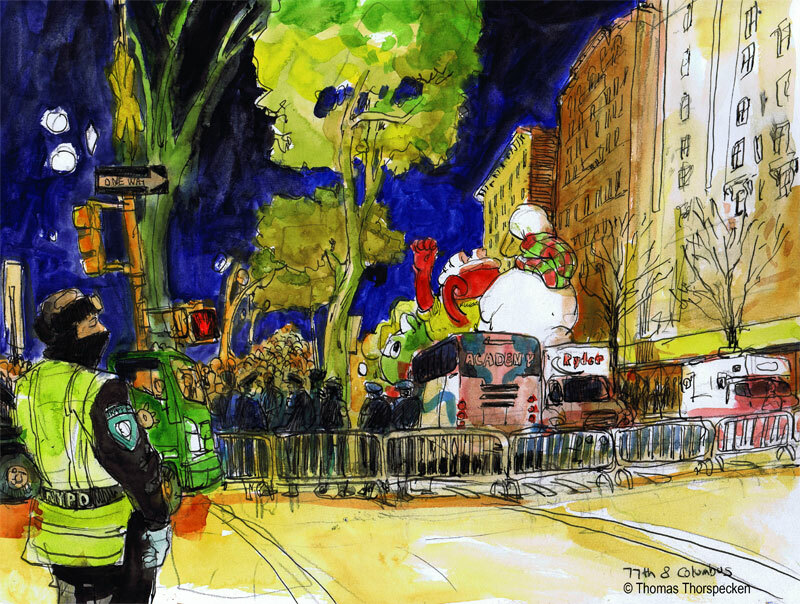 We all took the subway to the Upper West Side to see the Macy's balloons being blown up on 77th street next to the Museum of Natural History. When I lived in the city, this was an annual sketch ritual. I would stay up all night sketching and then watch as the crews allowed the giants to lift up into the breeze. There was always some balloon that would blow over into a light post, popping a limb. This year the crowds were astonishing. There was a line that branched off for two solid blocks and then wrapped back to where I was standing to sketch. The traffic cop standing in front of me tended to ignore all the pleas from suburban moms who wanted to know how to get in. Occasionally he would point but he never spoke. Terry went to visit an old friend named Kent Brasloff so I decided I had time to do this one sketch. Carol and Nini decided to go get dinner and they would meet me back here when they were done. The only balloons I could identify were an Aflac Duck, a Koolaid Pitcher and some Anime dragon. By the time I finished the sketch, the line had backed up to the point where I was in the crush of the crowd. I hadn't noticed since I was so focused on the strange nocturnal scene. When Carol and Nini came back, I was done. We texted Terry to let her know we were heading back down to the Battery to catch the ferry back to Staten Island. When we got off the subway, Terry called out to us as we were walking up the subway steps. She must have been in the next car. On November 17th, the day after the ice skating rink opened, The Annual Winter Park Harvest Festival was held on the West Lawn of Central Park. 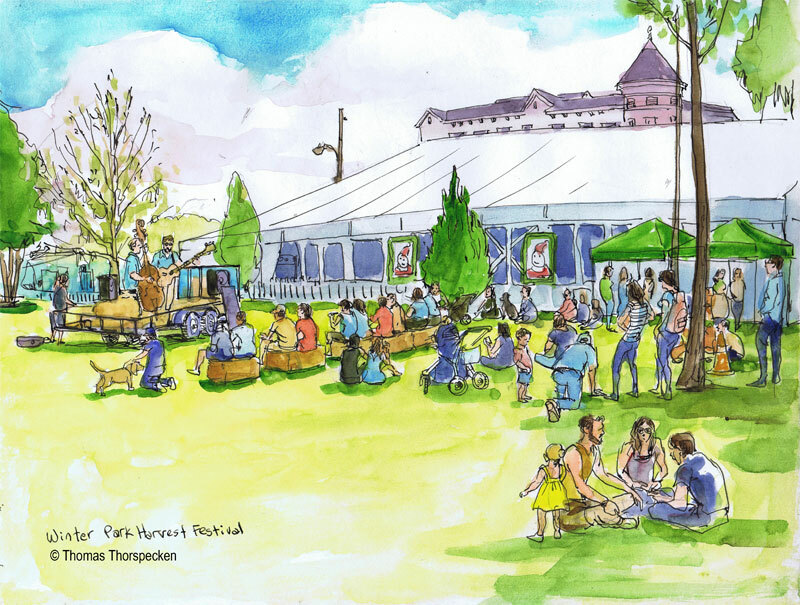 The white tent in my sketch is where the ice rink is housed.The festival is the brain child of John Rife who wants to help educate people to the benefits of eating locally grown produce. A community garden demonstrated what plants did well in Florida. Since the festival was held right before Thanksgiving, people could consider getting some locally grown, whole hearted goodness on the dinner table for the holiday After walking around and inspecting the fifty or so market tents, I was drawn to the sound of music. Several bays of hay and some speakers were piled onto the back of a truck trailer that served as the stage. A bare scrawny tree offered no shade for the performers and it was hot in the sun. I walked around the staging area several times searching for a shady spot with a good view. I finally leaned against a tree quite far from the stage. Austin Miller was performing. People sat on hay bales and families picnicked on the grass as they listened. "Hey, are you a registered voter?" I was asked. "Yes." I said. "Well then would you like to sign a petition to help preserve our natural resources?" I had already signed that petition downtown. I heard his pitch again and again. The music was just background noise for the fervor. I didn't care. It was a beautiful day. Gailanne Amundsen, of Jubal's Kin stopped to say hello. Her brother Roger Amundsen had started a locally grown business and he had a tent. Unfortunately, Jubal's Kin wasn't scheduled to play. There is a deep rooted Appalachian honesty to their songs that I love. I also bumped into Mark Baratelli and Julie Norris with her daughter Maya. Anna McCambridge Thomas offered me several fried crab cakes from the Big Wheel Food Truck. Boy were they good. Several people I hadn't met before stopped to tell me they follow my work online. One artist insisted I have to get involved in the annual Winter Park Paint Out. I've wanted to sketch that event for the past two years but there was always a scheduling conflict. After my sketch was done, I went to the Big Wheel Food Truck and ordered a stuffed Avocado. I relaxed in the shade and soaked in the music. On Friday November 16th at 3pm there was a Winter in the Park Ice Breaking Ceremony for the outdoor rink at the Central Park West Meadow. I was running late to the opening which would involve breaking a large peacock ice sculpture in the most dramatic way. That sounded like an enticing sketch opportunity. Walking through Central Park, I saw Emma Kuch Morris and Betsy Dye chatting on a park bench. I considered stopping to congratulate Emma on her recent marriage, but I was late! I heard then laughing as I rushed on with my art supplies slapping against my leg. After all that rush, I missed the peacock crushing. I didn't even see any shards. People were crowding around the rink to watch performers from the RDV Sportsplex Ice Den who began a special performance of “Babes in Toyland.” The performances were a bit too Saccharine sweet for my taste. The ice was then opened up for anyone to skate and I found far more entertainment in watching deep southern beginners falling repeatedly. A mom braced her little girl who was laughing with delight. Two teenage boys held on to the edge rails the whole time, moving in fits and starts. 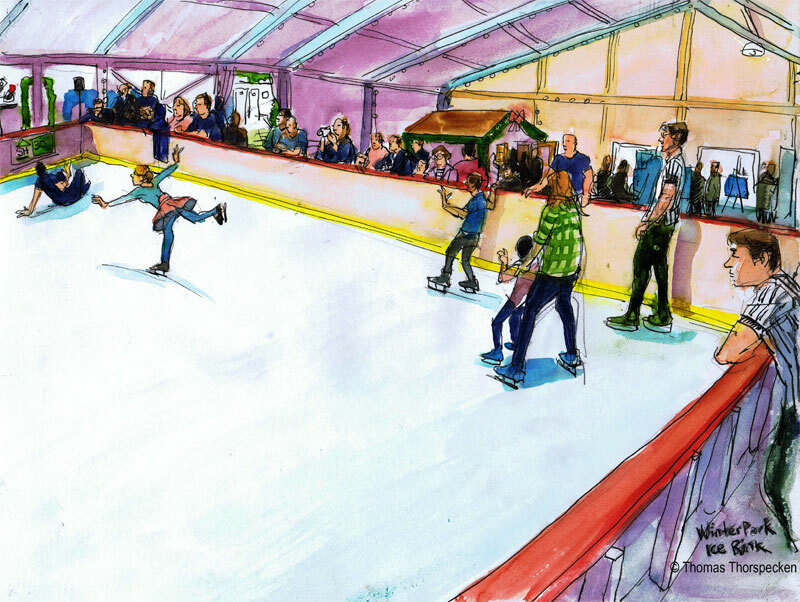 The Ice Rink will be open till January 8th. This is a great way to warm up to the holiday season, even if you're a Grinch like me who delights in the carnage. Info: (407) 599-3203, Skating includes skate rental $10. • Monday to Thursday, 3 p.m. to 9 p.m.
• Friday, 3 p.m. to 10 p.m. 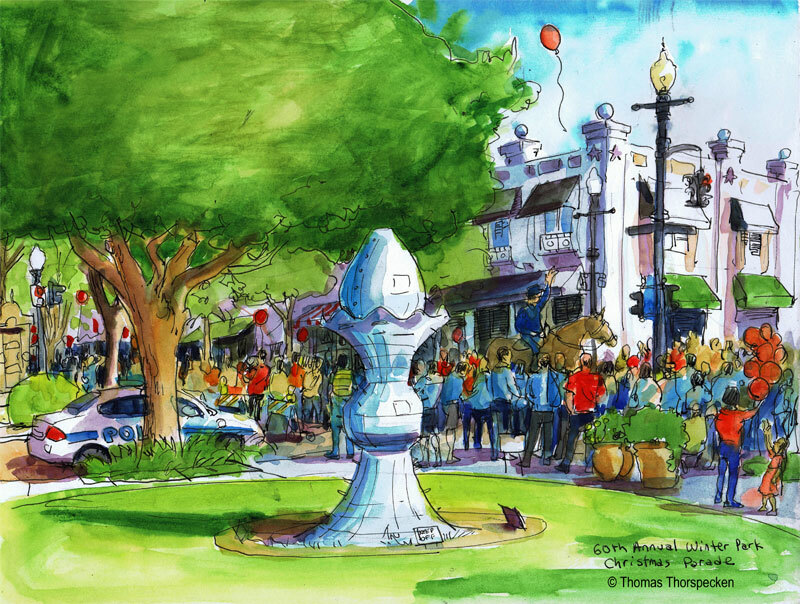 I wen t sketch the 60th Annual Winter Park Christmas Parade on December first starting at 9AM. Angela Puik, a young UCF photographer wanted to get some photos of me at work. She and her classmate Abu Ngauja are using me as a subject for their final project in their Advertising and Public Media class. They are pitching the idea of doing a video segment for a PBS Television show called, "One". I took a look at the program and it has some compelling local human interest stories. There is no guarantee that a video segment will be produced, but I worked with them to hopefully get them excited about documenting live with art. Parking in Winter Park that day was impossible, so by the time I got to the parade route on Park Avenue, the first police cars were flashing their lights to start the parade. Angela texted to see if I was at the parade. I told her I was by the silver statue, and it turned out that she was on the same street corner. I felt a little self conscious as I sketched. I figure for a photographer, watching a sketch develop might be like watching grass grow. When I started adding color, several kids started looking over my shoulder. A mom pulled her son away mortified. "I'm so sorry, Bobby, give the man some space!" Angela said she had what she needed and left before the sketch was finished. I quickly blocked in a policeman on horseback. 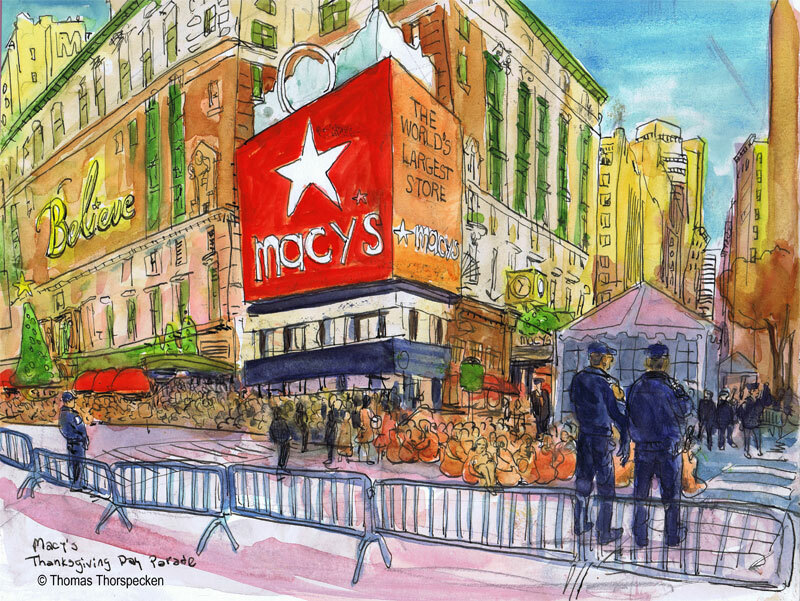 I walked up to the corner to watch the parade up close when my sketch was done. More than 100 units participated, including bands, local police and fire departments, marching bands, scouting groups, local dignitaries, and of course Santa Claus. Boy Scout troop 878 was walking by as I muscled my way up for a view. They handed out candy canes for the kids. Unicyclists charged up to kids on the curb seemingly off balance, only to recover at the last moment. Pre-teen cheerleaders shook their pink pom-poms. Behind me, two boys started climbing on the silver sculpture I had sketched. Their father scolded them. They then circled around the art while checking to see if their father was looking. Roses were being handed out and Cloe tried to shyly get one three different times. Her mom was shouting out directions. "To your left! Don't wait! Run over! She only has a few more!" Cloe returned dejected. Sky Craft had a float with a flying saucer and plenty of dried ice smoke. Someone released a candy cane tied to a red helium balloon. It rose up and got tangled in the street light until a breeze knocked it free and it rose up to the clouds. I left to go to Full Sail before the parade was over in order to avoid the mad traffic rush. 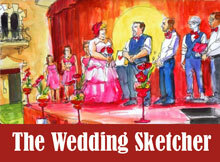 I am now accepting nominations for the Top 10 sketches of 2012. Leave a comment on this post to cast your vote. No limit on the number of nominations. Our last evening in France, Terry and I returned to Paris and found a hotel near the train station so we could get to the airport early the next morning. Unfortunately it was raining. Regardless, we decided to walk to Place des Vosges which is a gorgeous manicured park surrounded on all sides by historic architecture. It is the oldest planned square in Paris dating back to 1612. 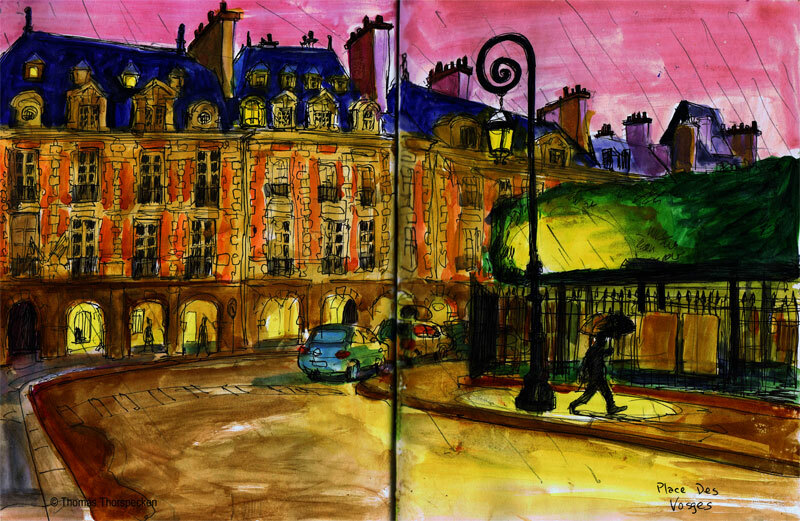 The corner building in my sketch was once the home of Victor Hugo from 1832-1848. It is now a museum devoted to his memory. 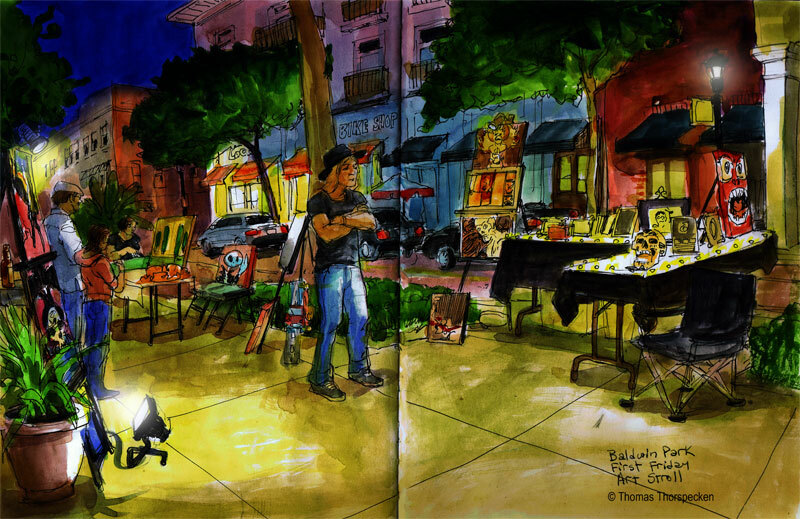 As I sketched, Terry scouted around and discovered several gallery openings. We grabbed glasses of wine at an opening of paintings of bull fighters and tango dancers. Outside music was playing on a radio and four or five couples were dancing the tango. These were skilled sensual dancers who understood their partners every movement. This was a truly memorable Parisian moment, a perfect way to cap off the trip. A gallery several doors down was showing bright colorful paintings done of opulent interiors done entirely with pallet knives and thick juicy paint. I rather liked the work and we met the artist. One last time we hiked back to the hotel watching the bustle and bright lights in the city of light. On Tuesday October 30th I went to the Death By Pop-Up Shop, (1844 A Winter Park Ave, Orlando, Florida 32803) for a Community Paint event. 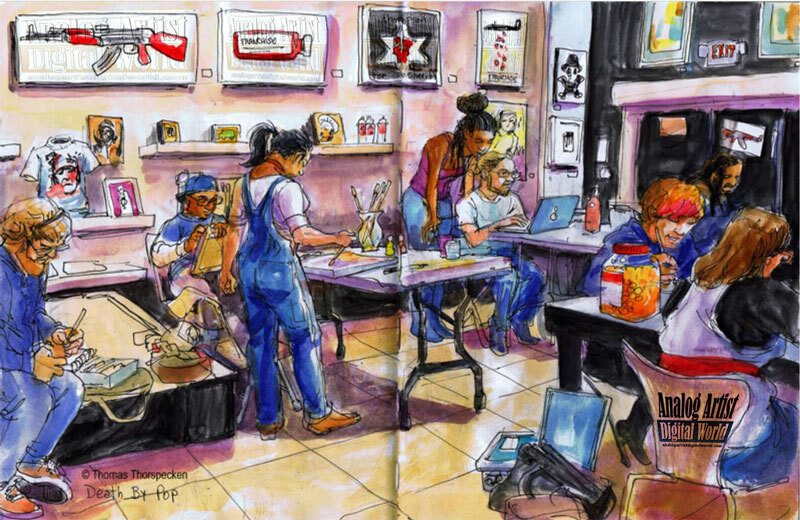 These Community Paint events will happen every Tuesday from 3-11pm. It is all about giving artists an excuse to get out of the house and escape some of the distractions for a day. 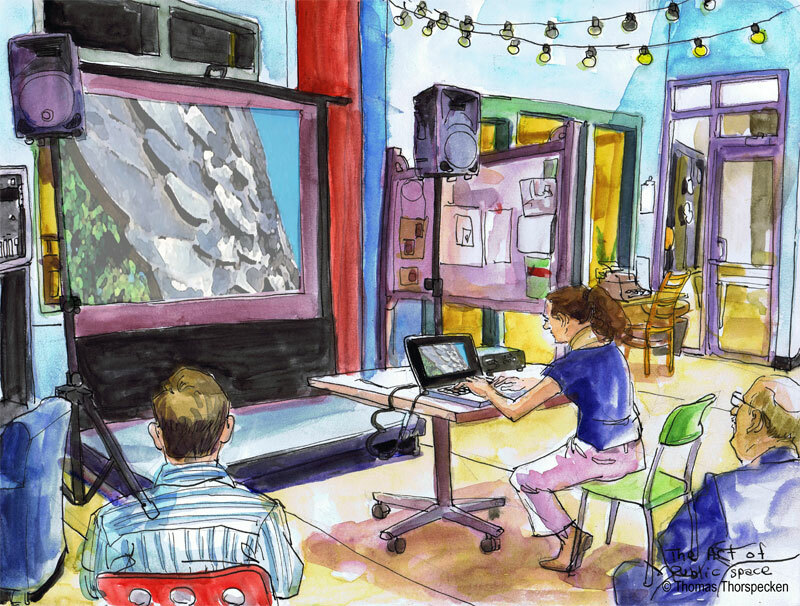 Artists brought canvases, easels, paint, sketchbooks, notebooks, laptops or whatever they needed to create with, and they worked along with fellow artists, musicians, poets and designers. Death by Pop is a hip urban custom clothing store with B-Side Artists work adorning the walls. Chris Tobar was there to show me around. Artists whose work were on display included: Steve Parker, Justin Barrows, Peter Van Flores III, Peterson Guerrier, Jaime Torraco, The three Bears, Cake Marques, Jeff Pfaff, Michael McGrath, Brian Heeter, Decoy and Chris Reason. Swamburger was the guest artist that evening. He sold one of his pieces online while everyone was working. He found an image online of a ghetto Spongebob and he laughed as he said, "This is just wrong!" A huge jar of Cheetos puff balls sat on a table, largely ignored. Artist Tiffany Dae was seated right in front of me. She was painting an intricate sculpted wooden totem. She assembles various photos found online into cosmic, ethereal images which are painted. I always like meeting artists and learning how they work. I spoke with Mila Belle Dykes just as I was leaving, having finished my sketch. I had met Mila Belle once before at City Arts Factory at Mia De los Muertos. She was painting a skull mask on a young woman's face. I considered sketching Mila at work that day, but she said she would be done in just five minutes. I needed more time so I focused on other artists. The painting she was working on at Death by Pop was light and airy with white doves appearing and rising within abstraction. She worked her oil on canvas with thin glazes retaining the vibrancy of light bouncing through the paint and back out. We took a train out of Paris on a day trip to Fontainebleau. Terry wanted to see a large opulent palace. The Château de Fontainebleau, once belonged to the kings of France. We took a bus from the train station into the town and then walked to the palace. We walked past this carousel on the way there. Terry wanted to take a tour of the interior. I set my stool up at the base of a large staircase and started blocking in a sketch. Within 15 minutes a guard walked up to me and told me I couldn't sketch. I hiked back to the center of town to find the carousel. 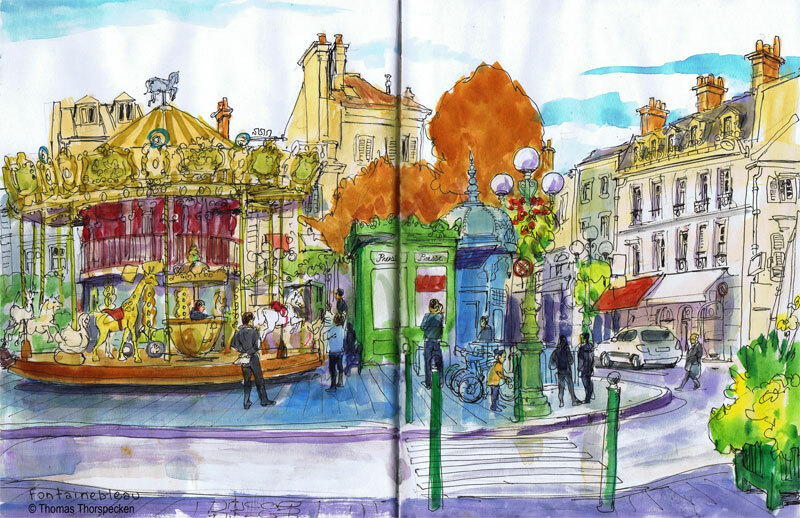 I leaned up against the palace gates and started sketching the carousel. Half way into the sketch a large ice cream truck parked in front of me, blocking my view. I moved my stool back in front of the truck and continued to work. The ice cream vendor invited me to lean back against the truck's tires. The owner of the carousel came over and she discussed my sketch over with the ice cream vendor. A motor cycle was rear ended by a car right in front of me. A very vehement and animated argument broke out. The car's bumper got caught on the motorcycle's rear tire, but there was no actual visible damage once the vehicles were disentangled. After the sketch was done, I hiked back to the palace. Terry and I ordered some croissants from the palace commissary, then we walked around the immense gardens. Several weddings were taking place on the grounds. Terry was invited to a fundraiser called, "An Evening of Shopping" at The Sanctuary Downtown, (100 South Eola Drive). The Sanctuary is the new building that now houses The Abbey and the Broadway Across America offices. The rest of the building is a luxury condominium. I arrived a little before Terry and took the elivator to the 5th floor. A phalanx of pretty boys were standing in the hall. To their left was an open public area with an open bar. l searched some more to find the apartment. The apartment which is the home of Ted Maines and Jeffery Miller, was absolutely gorgeous with a fabulous collection of original modern art. There was a glass machine gun sculpture, while Warhols and ironic pieces by Ed Ruscha and Jane Hammond decorated the walls. As a collection, the work has a dark under current yet was inherantly humorous. People crowded around a large table which had expensive David Yurman watches and jewelry. The David Yurman team was lead by Jada Marzolf-Beekman. Funds raised from sales would benefit the Holocaust Memorial Resource and Education Center's program called, Upstanders: Stand Up to Bullying. The Upstanders: Stand Up to Bullying program is designed to help children understand the dynamics of bullying. The education begins with a moving presentation of a parent whose child committed suicide in response to bullying. Parallel presentations in the evening help parents and other community members find out how they can be part of the solution. The pledge neatly sums up how we all can help. "I will stand up to bullying. I wont be a bully. I won't let anyone bully me. I won't let anyone bully someone else. I have a responsibility to stop bullying in my school and in my community." On November 14th, I went to Urban ReThink to hear artists Brian Phillips, Dina Mack and Tory Tepp talk about their Art and Process. Dina Mack lead off showing her work from inception to today. She worked in the beginning by doing collages. Her work later matured and become austere in its simplicity and abstraction. She did an instillation in which she froze written documents in ice and then let them melt in the gallery. For the Corridor Project, she had a series of cloth napkins which she used to blot her lipstick. She vividly remembers her grandmothers perfume, so she scented the fabric. The lipstick stained napkins were an autobiographical look back at memories she had of her mother and grandmother. Her grandmother used to give her a butterscotch candy if she sat still in church. The sound of the wrapper still brings back the memory, so she filled a vintage purse with butterscotch wrappers. The ephemeral installation was installed on the lawn of the Mennello Museum for only a few days. The sense of smell is only now being researched. Apparently all the Marriott hotels in the country use the same perfumed cleaning products. A scent can trigger many vivid memories. Much of Dina's work speaks in a whisper, implied, like a scent on a breeze. Tory Tepp is now a resident artist at the Atlantic Center of the Arts in Daytona Beach. He began his career as an artist doing traditional paintings. He hit a wall where he felt painting didn't have any meaningful place in today's society. He stagnated, not knowing where to go as an artist. Then he started planting seeds and growing a garden outside his Los Angeles studio. This garden helped him feel more connected to the people in his neighborhood. He started using abandoned shopping carts as planters. This evolved into Urban art with a taste of nature. An installation at a college consisted of a series of grass covered dirt mounds that acted as a natural place to meet, lie back relax and mingle. He is now working on a similar installation as part of his Atlantic Center of the Arts residency. With any luck, I'll get out there to sketch the work in progress. Brian Phillips showed his illustrative work. He has a whole series of paintings of house fires illuminating the night sky. He has some of his paintings hanging at Urban ReThink now. One piece in particular caught my eye. It was a painting of a stone arrowhead with a bold flat backdrop. This simple image implies much about the violence of survival. That image lingers. Brian didn't claim any deep rooted underlying themes to his work. For the people intent on finding hidden meanings, he did a painting of a house fire and diagrammatically circled some embers. The diagram pointed to a bird, leaf and phone. It was pure nonsense. He paints because he loves the process. I'll be giving a talk on my art and process this Wednesday December 12th from 7PM to 9PM at Urban Rethink, (625 E Central Blvd Orlando, FL, 32801). Rick Jones will be presenting, discussing and displaying his works on the ReThink wall, along with photographer Hannah Glogower. Stop by and say hi. October was Domestic Violence Awareness Month. Zahide Love, along with her friends, Gigi, Jerri, Jillian, Michelle, Nadine, Aswadah, organized a domestic violence fundraiser at Bravo Cucina Italiano, (7924 Via Dellagio Way Orlando, FL). The ladies of Space to Grow helped combat the devastating effects of domestic violence by coming together to network and build new relationships while raising money for a good cause. The $20 donation entry included an appetizer and a raffle entry for a resort stay. 100% of the contributions were donated directly to the Women's Residential Counseling Center, (WRCC) to benefit the women and children survivors of domestic violence. Founded in 1921 the WRCC has evolved over the years ot become an important safe haven for women and their children who are victims of domestic violence. In 2010, 113,378 crimes of domestic violence were reported to Florida law enforcement agencies resulting in 67,810 arrests. During fiscal year 2010-2011, Florida's certified domestic violence centers provided 477,489 nights of emergency shelter to 15,789 survivors of domestic violence and their children. Many more survivors of domestic violence are not reporting their abusers to the police or accessing services at domestic violence services due to reasons such as shame, fear, or being prevented from doing so by their abusers. For this reason, we may never know the true extent of abuse in our country and in our state. Bravo's happy hour menu was extended for the fundraiser. Terry joined me to network as I sketched. Darkness quickly set in, but the restaurants outdoor lights kept things cheery. There were a few speakers, but unfortunately the loud Sand Lake Road traffic noise made hearing difficult. I did hear Zahida speak, and she announced to those gathered that she had been the victim of domestic abuse. This was the first time she had admitted that in public. She is certainly brave, vibrant and active with a charitable heart today. There was a ground swell of applause. A Space to Grow pamphlet announced, "It is sad when someone thinks they have no one to talk to about abuse. It is a horror if you don't ask. Talk about it." The statistics are staggering. There is a chance someone you know is affected. Reach out and respond. E-mail at info@spacetogrow.org. WRCC crisis hot line 407 425-1076. I went to the Baldwin Park First Friday Art Stroll for the first time. I bumped into Brad Biggs who organizes the event and he said artists were happy with sales leading into the holiday season. The art stroll used to take place in Ivanhoe Village but since it has moved to Baldwin Park, It has grown in size. Artists set up tables on the sidewalks along New Broad Street. I settled in to sketch the work of Shane Malesky of Chronic Damage. His work is marketed as horrifically delicious. His wife Heather was helping him set up. They found an electrical outlet which meant they had plenty of light. I liked that he had a bold study of a Vincent Van Gogh painting of the artist walking on the roadside. He explained to a passer by that the image showed the artist forging his own path, even if it was a lonely path. I rather liked the work because of its bold bright colors and dark subject matter. A human skull with is jaw propped open held his business cards. Artists would visit each others booths. One artist vowed to murder the squirrels in his attic by any means necessary. Next to Shane was Jose Tores who came from Deltona to show his decorative art on wood. 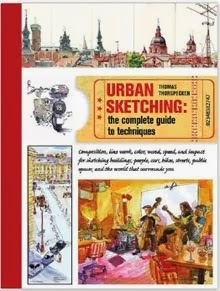 He spoke with me for a while about how Japanese animation had inspired him to start sketching. Brian Stuckey had photo prints of sculptures done in a bold cartoonish style. They looked like complete scenes from an animated short. Vaughn Belak was having great sales in October and perhaps his quirky dark imagery will continue selling right through the new year. First Friday's Art Stroll is TONIGHT starting at 6PM. 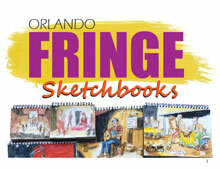 It is a great place to get some original art. Then again you could just order a print or original from this site. 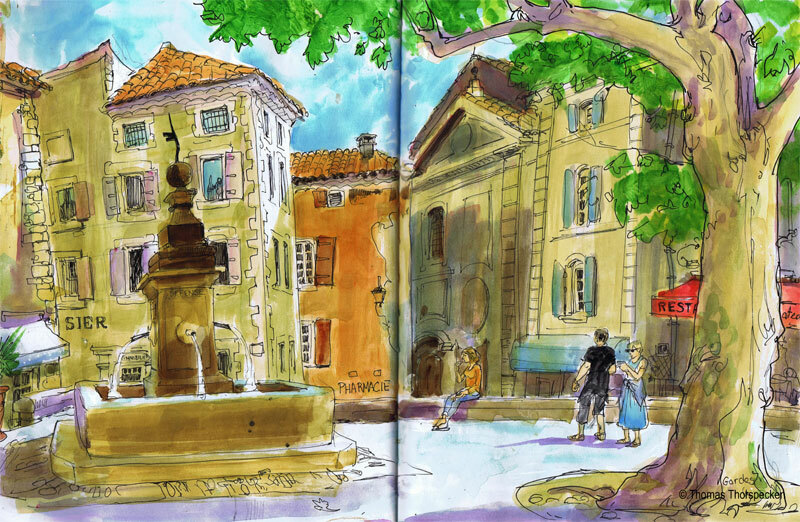 Terry and I explored many towns in Provence, France. Lacoste was a typical small mountain town. 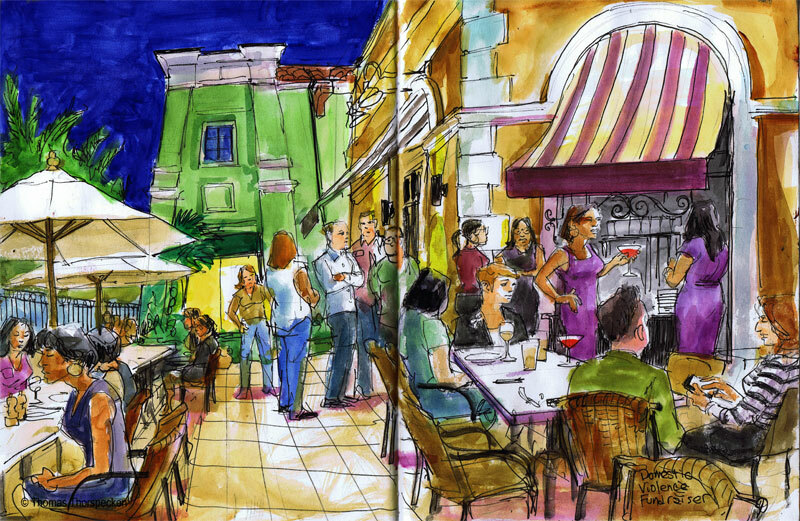 Outdoor cafes are the heart of any town. Towns people and tourists linger outside reading the paper or getting into heated discussions. It was the golden hour before sunset and the sun caused the trees to warm up to a bright orange. The cafe staff folded down all the umbrellas as the outdoor seating slipped into the shade. I was seated next to a cafe kitchen door and I listened to the clatter of dishes and orders shouted out in French. I was delighted that it was warm and comfortable sitting outside. 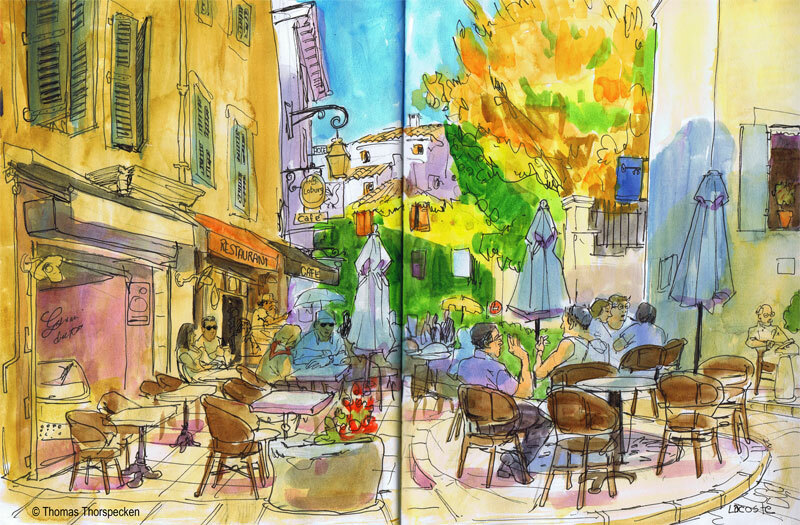 With this sketch finished, we went to the town of Roussillon where large ochre deposits are found in the clay surrounding the village. The cliffs glowed a bright warm ochre as the sun set. Ochres are pigments ranging from yellow and orange to red. One of the former ochre quarries could be visited via the Ochre Path. Unfortunately the quarry's were closed, but all the ochre pigments used in paint come from here. 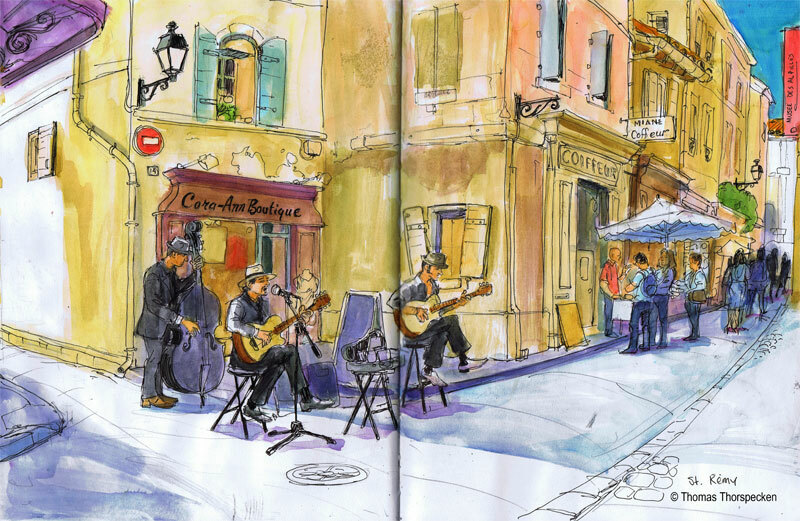 Looking back at my sketches, I realized that I used yellow ochre extensively in my France sketches. There was a store that sold raw pigments but sadly it was closed as well. 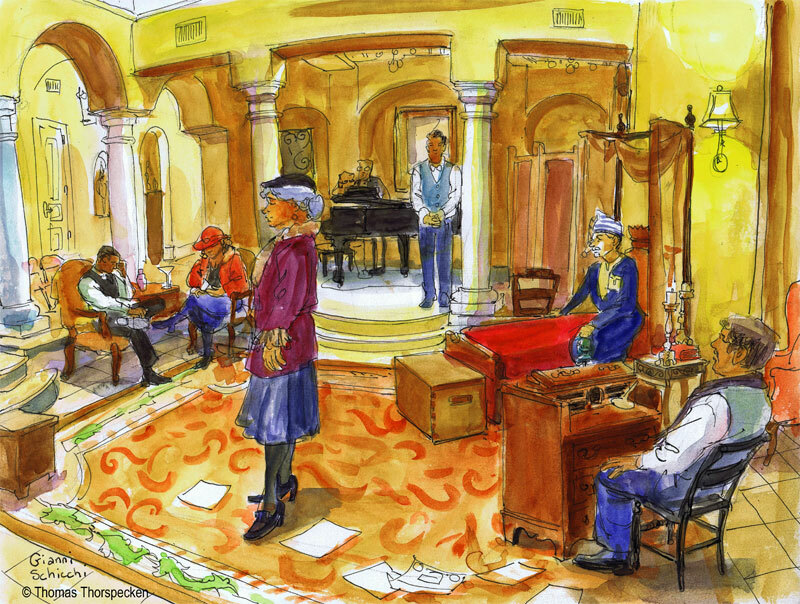 I went to the final dress rehearsal for Florida Opera Theater's production of Gianni Schicchi at the home of Kathy and Steve Miller in Winter Park. The rehearsal had been moved to 8PM but when I arrived, the circular drive was already full of parked cars. Light glowed warmly from inside the mansion. The sunken living room offered a perfect set for the opera. The actors, in costume, stood around Robin Stamper on the piano in the beginning, going over the songs. This is a very accessible opera since all the lyrics are in English. Stage director, Eric Pinder, then had the cast rehearse their final bows. 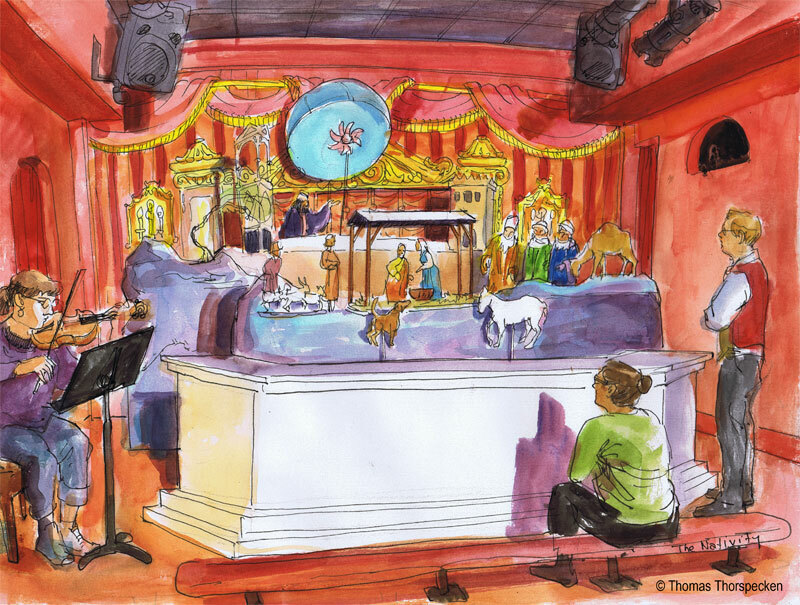 Eric was very gracious about letting me sit in and sketch the rehearsal. 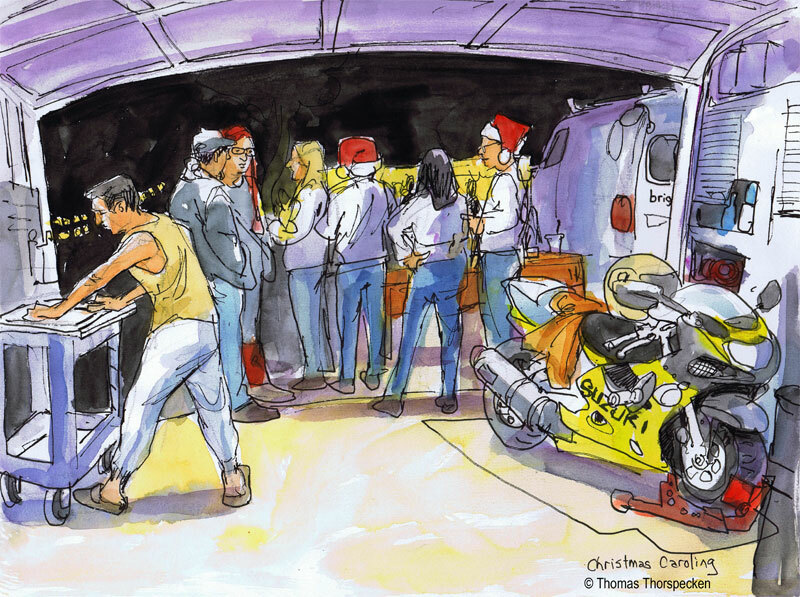 He informed me that I had once sketched him at one of Mark Baratelli's early food truck gatherings. Gene Tate sat on the bed as the cast got ready to do a full run through. He then got under the covers. I didn't realize that he had perhaps the easiest role in Giacomo Puccini's comic opera, playing Buoso Donati, who has just died. Relatives of Buoso sit around the bed lamenting his death and more importantly yearning to find out the contents of his will. They savagely search everywhere for the document, throwing papers everywhere. When it is found, they are mortified to discover that everything had been left to a monastery. They then truly cry and lament their loss. Gianni Schicci is asked to help find some loop hole and he advises them to pretend that Buoso is still alive long enough to get a new will drafted. The dead man is treated like a puppet as Gianni throws his voice, trying to convince a visiting doctor that he is alive. Gianni himself gets under the sheets to dictate the new will in which he takes everything in order to unite his daughter with her true love, Rinuccio, played by Austin Hallock. The aria, Oh my dear papa, sung by Lauretta, Gianni's daughter, played by Shannon Jennings, is one of Puccini's most well known, and one of the most popular arias in opera. Opera is still alive in Orlando. When: December 8th, 7:30 p.m., December 9th, 2 p.m.
All performances will be followed by a reception. Terry and I drove from one small provincial town to another. Gordes was perched way up on top of a mountain with small roads and narrow passages. A small fair had just shut down with it's rides and vending trucks packed up and ready to go. I settled myself in the small public square with a large fountain. "Defense" was inscribed on the fountain I presume from WWII. There were no large crowds here, just the occasional tourist eating a snack or resting. Terry and I didn't understand all the road signs. Once we drove up a road with a sign that had a red circle with a white line through it. We discovered that meant "One way" since another car was coming the other way on the narrow one lane road. Locals shouted and waved at us to back up. We backed out gingerly for a solid block. Driving on the mountain roads took nerve and faith since every blind turn could result in a head on collision. When cars passed the opposite way, one car or the other would have to pull off the road. The closest call we had was with a huge tourist bus that didn't yield at all. Our small Porsche shook as it roared by. There were traffic circles every few miles which were like mini smash-em derby's. Slipping in and out of the circle traffic was a refined art with a dash of chaos. Terry and I drove to Saint Remy, France from Avignon on market day. The ancient cobbled streets were all lined with vendors selling their wares. Some vendors sold tourist trinkets like cicada sculptures that chirped if you stood too close, or wooden frogs with ridged backs that made noise when a stick was rubbed across it's back. There were clothing vendors and a huge fresh fruit and produce market. Fish were stored on ice and one lady had a large shark for sale. I heard music in the air and walked towards it. Vincent Van Gogh walked these cobbled streets and perhaps he frequented this market trying to stretch the money his brother gave him or supplies. Terry shopped, as I hunted for a sketch opportunity. Musicians were playing outside Cara-Ann Boutique. Shoppers, stopping to listen stood at a polite distance. The band was called Dos Amigos with Joselo Gonzalez and Louis Pousa on guitars. They were joined by a cello player whose name I didn't catch. I tapped my foot to the beat as I sketched their hip fedoras and slick black silhouettes. Crowds gathered and left between sets. Cara-Ann came over to inspect my sketch and she seemed delighted although I didn't understand a thing she said. Joselo talked to me once they were done playing and he gave me his business card. 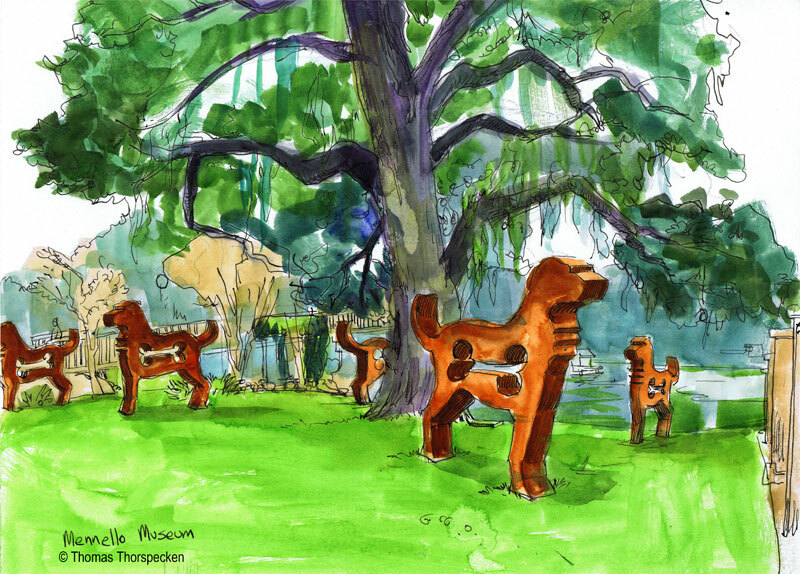 At the foot of a walkway bridge that leads from the Mennello Museum to the suburban neighborhood on the opposite side of Lake Formosa is a "Red Dog" sculpture by Dale Rogers. I love walking across that bridge as the sun sets. Snapping turtles leisurely paddle their way through the thick green water for a breath of air. The bridge is now part of the Dinky Line Trail, an exercise trail that will weave through the Virginia Drive, Ivanhoe Village, neighborhood. Under current plans, the trail ultimately could stretch from the new arena in downtown Orlando past Lake Highland and the city's Loch Haven Park before terminating at Mead Garden in Winter Park, where it could eventually tie into other trails. Also on the drawing board: a spur to Lake Baldwin. Driving past the Mennello, I saw a pack of huge rusty dogs, which were giant versions of the "Red Dog" in he Sculpture Garden and around the entrance to the museum. I had to pull in. The museum has welcomed back Rogers with a fresh pack of twenty 8-foot-tall, 10-foot-long sculptures of dogs made of Cor-ten steel. Small versions are available for sale in the gift shop. Rogers has said that he thinks his work gives you a dog’s eye view of the world, and he hopes art, the public and animal welfare can all come together for a good cause. The show is open to the public now through March 17th, 2012. Today, Saturday DECEMBER 1st, there will be a Big Dog Show Happy Hour from 4 to 6 p.m. Admission is free. Bring your four-legged friends to this outdoor reception for Dale Rogers and the new installation of 20 Brown Dog steel sculptures. Refreshments for sale for dogs and their owners from The Spork Happy Food Cafe and Puppy Love Cafe, along with litter bags. Bring donations of pet foods and supplies to donate to local animal shelters. Adopt one of the rare breeds to benefit Canine Companions for Independence and A New Beginning Pet Rescue.